“I’m delighted that Rachel is going to help us get even more Women players involved in the campaign. 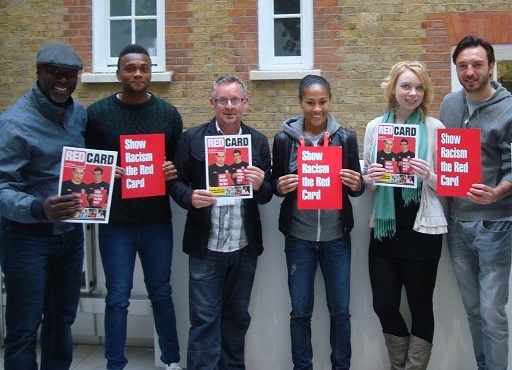 She is a fantastic role-model for young people"
England’s most capped player, Olympian and Arsenal Ladies star Rachel Yankey met with Show Racism the Red Card team members in London yesterday. Rachel has agreed to become the latest Show Racism the Red Card Honorary Patron and also an Ambassador for the Campaign to advance the involvement of women footballers in SRtRC. Ged Grebby, Chief Executive of SRtRC said “This season has seen the campaign make a concerted effort to have a better gender balance on the panels taking young peoples’ questions at educational events at clubs. We’ve had more Women’s team players involved than ever before. Rachel is also going to be involved in our work in schools and will be appearing at our upcoming Teacher Training: Countering Contemporary Racism event at Arsenal FC.